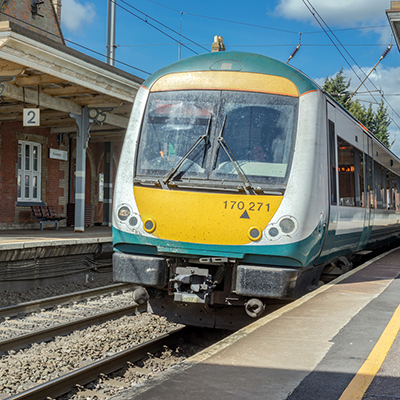 Ricardo has been appointed by UK-based rolling stock owner Porterbrook to provide engineering expertise for the integration of MTU’s hybrid powerpack into a converted Turbostar diesel multiple unit (DMU) – a first in the UK rail industry. The HybridFLEX programme will help reduce diesel emissions from trains in built-up areas where there is no electrification of the network because the converted trains will be able to operate in a “silent” mode using on-board batteries as they pass through urban areas or call at station stops. When diesel power is required for propulsion, it will be provided by an engine conforming to the latest EU Stage V emissions standards (due to come into force in 2021) with ultra-low particulates and NOx. Although EU Stage V is not currently mandated for rail, Porterbrook, Ricardo and MTU are committed to applying the latest technology today, reducing emissions in urban areas. With the on-board batteries capturing the energy typically lost through braking - coupled with a more efficient engine and transmission - the overall CO2 emissions will be reduced by as much as 25% when the train enters service in 2020. The initial trial period should also confirm the higher performance and capability of the hybrid systems compared to the standard variant of the Turbostar train. Ricardo’s engineering team are performing all the integration engineering and safety assessments of the bare hybrid powerpack provided by MTU for a current Turbostar that will be converted into the first HybridFLEX vehicle. Ricardo will oversee the seamless integration of all the mechanical, electrical and critical controls systems, committing teams from its Rail and Automotive divisions to support the engineering tasks – and the relevant safety, certification and approvals activities - and ensure the safe and successful operation of the train during public trials. “We are looking forward to supporting Porterbrook throughout the development of this innovative and important project for the industry,” said Olivier André, UK MD of Consulting, Ricardo Rail. “The UK has many diesel vehicles on its network. This is an opportunity to show they still have a viable long-term future as hybrids, featuring reduced NOx, carbon and noise emissions as well as offering the potential for lower operating costs”. The project is a clear example of Ricardo’s cross-sector capabilities, utilising its Automotive division, with their hybrids and electrical expertise in control systems, batteries and engines, alongside Rail colleagues overseeing the critical job of integration into the original vehicle. This combined experience of state-of-the-art hybrid programmes in automotive and industrial projects is one of the key reasons Porterbrook selected Ricardo as chief technical partner for this project. Once the completed trial confirms the expected performance advantages of the hybrid system, Porterbrook will work with existing and future Turbostar customers to evaluate conversion of these fleets to HybridFLEX, accelerating the move away from diesel-only trains ahead of the government’s 2040 target.